(Brooklyn, New York) — On a November morning at Hebrew Language Academy, a public charter school in Brooklyn, a 5-year-old girl led a dozen kindergarten classmates in a “Simon says”-like game, telling them in Hebrew to touch various articles of clothing. “I don’t have one!” a little boy blurted out, also in Hebrew, to giggles all around. Just three months before, Danon proudly noted, most of those children had not spoken a word of Hebrew. Making the scene even more remarkable was something else: Both the girl leading the game and the boy without a skirt were African-American — as were several of their classmates. It turns out that the language of the Torah, in combination with school choice, can be a force for racial integration. The academy’s overall enrollment, in fact, is 41 percent black, 53 percent white and 3 percent Latino, a far cry from the all-Jewish enclave that some skeptics foresaw when the school opened seven years ago. Its three-year-old sister school, Harlem Hebrew Language Academy is even more racially mixed at 42 percent black, 38 percent white and 20 percent Latino. Both stand out as islands of integration in the New York City public school system, which a UCLA study identified two years ago as one of the most racially and economically divided in the country. 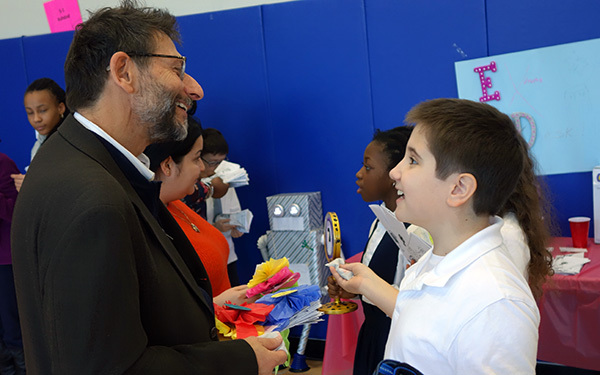 Their diversity is no accident, according to Jonathan Rosenberg, president of the Hebrew Charter School Center,the parent organization of the two New York City schools and seven others around the country. Rosenberg said organizers of Hebrew Language Academy put “a lot of sweat and work” into enrolling students of different backgrounds — and he argued that more charter schools should do the same. “In New York City and New York state, we have grown so accustomed to egregious patterns of segregation that they’ve almost become part of the backdrop,” Rosenberg said. Sixty-two years after Brown vs. Board of Education, Rosenberg said he is dismayed that the formal segregation banned by the Supreme Court has been replaced by de facto segregation — driven by white flight, mortgage redlining, poverty-related housing patterns and arbitrary school district boundaries. Most of New York’s charter schools, meanwhile, have focused on serving the students who need help most: black and Latino kids whose only other choice is a poor-performing district school. Their “no excuses” goal has been to demonstrate that children of color can succeed if given the right tools and attention, which has been borne out by the test scores of high-performing charters such as the Success Academy network. A side effect of this approach is racial segregation. The 2014 report by the UCLA Civil Rights Project found that 73 percent of New York City’s charter schools were less than 1 percent white, and 90 percent were less than 10 percent white. Only 8 percent had white enrollment at or above the citywide average of 14.5 percent. At Hebrew Language Academy, diversity was a priority from the beginning, said founder Sara Berman, who is board chairwoman for both that school and the Hebrew Charter School Center. That most American schools are not melting pots was brought back to the nation’s attention by the 60th anniversary of Brown vs. Board of Education in 2014. The UCLA study brought the issue painfully home for New York City. A recent two-part episode of the public radio program “This American Life” made a compelling research-based case that integration is the surest way to equalize education for children of color. Charters have the advantage of being schools of choice. They don’t order families to enroll, they persuade them to. Plus, as James Merriman of the New York City Charter School Center points out, charters are not wedded to any particular neighborhood or ethnic group. If the demographics shift, people are less likely to resent being “taken over.” “Charters can provide a place that is no man’s land, so to speak,” Merriman said. This is where Hebrew Language Academy came in. The city already had many dual-language charter or magnet schools for Chinese, Russian, Korean, Arabic, Greek and other languages. Many were among the city’s more multi-ethnic schools. Berman said her father — financier-turned-philanthropist Michael Steinhardt — and other like-minded donors set out to establish something similar for Hebrew. As she studied how to make that goal a reality, she said she was particularly inspired by a tour of the Hellenic Classical Charter School in Brooklyn, which has emphasized Greek language, food and culture, yet enrolled a substantial number of African-American and Latino children along with those of Greek heritage. Berman and the other organizers then faced the usual challenges of starting a charter in New York City — especially in finding suitable real estate — with the further complication of recruiting a diverse student body. Working to their advantage was the broad appeal of charters for black and Latino families, who tend to live in neighborhoods with poor-performing district schools, and the uniqueness of the theme. “I had a feeling that in New York City a lot of families would be interested in a first-rate school that taught Hebrew,” Berman said. That proved correct in the case of Noellene Foresythe, an immigrant from Trinidad who was eager to keep her son Jayden out of the neighborhood district school, which had a reputation for fighting. As she scouted for an alternative, Hebrew Language Academy caught her attention. 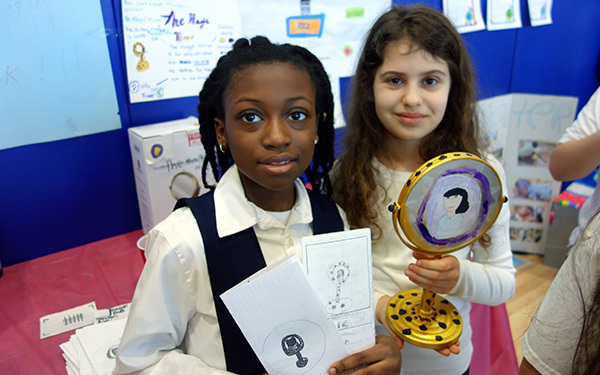 To maximize the variety of families who would enter their admission lottery, HLA organizers chose to locate in Community School District 22, a section of Brooklyn with a mix of immigrants from Russia, Israel, the Caribbean and the Philippines along with African Americans and Latinos, said Shane Goldstein Smith, the Hebrew Charter School Center’s executive director for the New York region. Organizers ran into community opposition when they sought to co-locate in an existing district school — a not-uncommon experience for charters — and eventually chose instead to use leased space for several years before renovating a building of their own. Academically, Hebrew Language Academy has had its struggles. It received an “F” on its report card from the New York City Department of Education in 2013, its fourth year of operation. City officials said the school’s test results were above average, but had not shown enough improvement from year to year. The test scores have since strengthened. Today, under revised standards implemented by de Blasio’s administration, the school is rated “good” or “excellent” in all categories, including academic performance. For the 2014-15 school year, 42 percent of its students passed their state English tests, and 64 percent passed in math, substantially beating the averages for District 22 and the city as a whole. The academy occupies a waterfront building in an otherwise industrial section of Mill Basin. The renovated warehouse is roomy and pleasant and still has a slight smell of fresh paint. Under the school’s immersive approach to language instruction, students receive a period of formal Hebrew lessons each day, and several of their other classes are conducted in both English and Hebrew, with one teacher speaking each. Hebrew instructors also preside at meals. During one language lesson, students clustered on the floor in semicircles around instructors who led them in speaking, reading and writing exercises, using nothing but Hebrew. Rather than simply asking students to call out the name of an object or conjugate a verb, they wove words and concepts into a flowing dialogue with students. Often, the teachers use worksheets and other materials they have designed and made themselves, because most of the commercially available Hebrew-language materials have too much religious content to be appropriate in a public school. Whether playing games or doing exercises, the students appeared thoroughly engaged to the point that they scarcely seemed to notice adult visitors coming in and out of their classroom. Nor was a word of English heard. 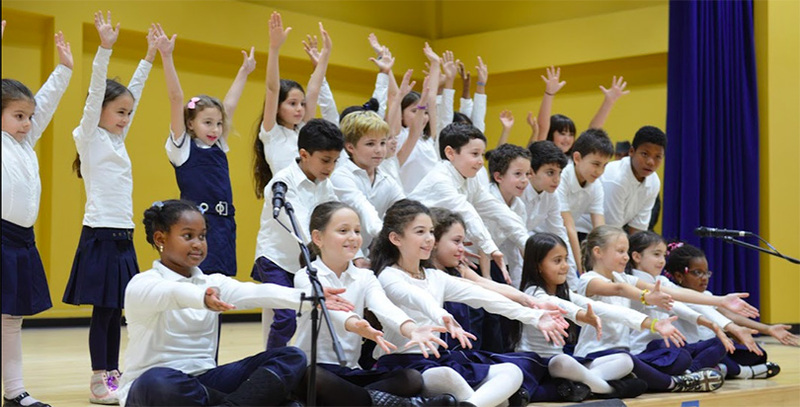 Like most charter schools, Hebrew Language Academy relied heavily on philanthropic support at the start. Now in its seventh year, the school operates almost entirely on government funding, primarily the $13,877 per pupil it receives from the city under the state charter school law. Berman said that amounts to 70 percent to 80 percent of the per-pupil funding for nearby district schools. Her academies are not alone in harnessing the flexibility of charter schools to promote racial integration. The National Coalition of Diverse Charter Schools, founded in 2014, has dozens of members in 12 states and the District of Columbia. Rosenberg, the president of the Hebrew Charter School Center, is a founding member of the coalition’s board. Another member, Century Foundation fellow Halley Potter, noted that the first proponent of charter schools — the United Federation of Teachers founding president, Albert Shanker — had meant for them to be teacher-run and draw students from across a region instead of a single district. “In that original idea, student diversity was built in,” she said. Charter leaders later drifted from Shanker’s vision — leading him to repudiate the movement — but Potter said she welcomes the renewed focus on diversity. Standing in the way of more progress for diversity-oriented charter schools, Rosenberg warned, is a state law mandating that charter enrollments closely match the economic makeup of their home school districts. That rule effectively bars charters based in poor districts from trying to bring in wealthier white families. Rosenberg said the law is well-meaning, but should be made more flexible. The value of the dual-language approach used by Hebrew Language Academy and other culturally themed schools was confirmed by a recent study out of Portland, Ore. The study by RAND Corporation and the American Councils for International Study found that students randomly assigned to dual-language programs gained an extra nine months’ worth of reading ability by eighth grade. Harder to quantify are the long-term benefits of learning and socializing with kids of different races and classes. Berman recalled an African-American student at Hebrew Language Academy whose family home was destroyed in a fire. “The city was going to provide housing so far away that the child was no longer going to be able to attend HLA,” she said. But then a white family from the school with access to an empty apartment offered it to the family who had lost theirs. Bill Hammond is a writer and journalist based in Saratoga Springs, New York. From 2005 to 2015, he was an Albany-based editorial writer and columnist for the New York Daily News. He previously reported for the New York Sun, the Daily Gazette of Schenectady and the Post-Star of Glens Falls.